Are you in the market for a new range or cooktop for your kitchen? If that is the case, something you may not have considered is the fact that not all cookware is created equal when it comes to being “induction-ready”. Let me explain. In an induction cooktop, a coil of copper wire is located beneath each element on the stovetop. When the element is switched on, an alternating electric current begins flowing through the coil which produces an oscillation magnetic field. This, in turn, induces an electric current into the pot on that element. The electric current in the pot produces what is called resistive heating, and that is what cooks the food. Before I go any further, I would like to quickly point out some of the main reasons why you might want to go the induction route. For a serious home chef, the biggest reason is likely to be that, just like with gas, you can adjust the heat instantly and with great precision. Another pro is that there is no wasted heat. With gas or traditional electric cookers, everything around the range receives the thermal energy from the element or burner that is turned on, which means it can get pretty hot in the kitchen when you’re preparing your meals. We’ve found a newer company headquartered in Austin, TX, that is producing reasonably cost induction-capable triply right here in the USA. 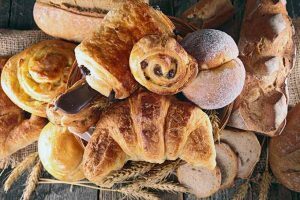 Their quality is on par with All-Clad but at about half the price – just slightly more expensive than Chinese produced imports from the major brands. They can price their products at a reasonable cost because they sell direct. No middle men, distributors, or retailers marking up the price. 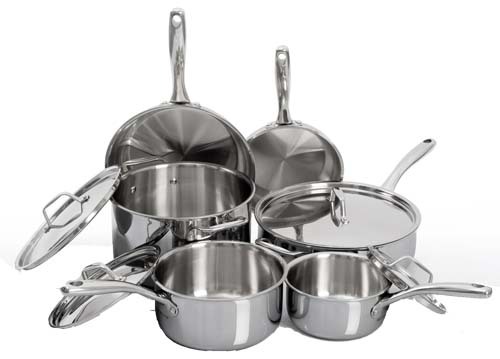 The Sous Chef Collection is Made In’s largest grouping and includes most of their pots and pans that they produce and is the set we recommend. Remember, you are getting made in the USA cooking vessels at around the SAME PRICE as Chinese manufactured goods from the likes of Calphalon, Cusinart, and all the other major labels you’ll find in the big box stores…with arguably better quality. You can read our extensive review of this high quality, low cost set or you can check it out directly on Made In’s website. In induction cooking, the heat only comes from the electric current flowing INSIDE the cookware, so the energy is contained. This means a much cooler kitchen. This also means a cool cooking surface. Even when the element is on, you can put your hand down on it and feel nothing, since the heat comes from the reaction between the copper coil beneath the surface of the range and the magnetic material of your cooking vessel. This is a great safety feature, especially if you are accident prone, like me, or you have young children, as we do in our home. 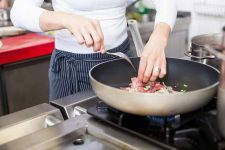 Now, since what produces the electric current is a magnetic field, the cookware you use for the induction stove needs to be made of a magnetic material, meaning either iron or iron-based (i.e. steel). The most obvious options include stainless steel, cast iron, and carbon steel. 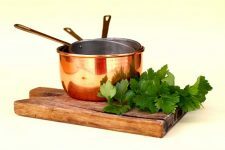 However, there are a few surprises when considering what pots and pans work well with induction cooktops – there are some nonstick aluminum and copper examples that will play nicely with induction. For professional chefs, the choice is almost always going to be stainless steel, with a couple of cast iron options for certain uses. Sadly, stainless steel for a home cook can be a little pricey, especially for the higher quality stuff. However, I have generally found that if I buy a quality product the first time, I won’t have to replace it two, three, or five years down the road. That is a significant savings in and of itself. Not all stainless steel is created equal. The least expensive stainless steel products will have no core at all. The best stainless steel cookware has aluminum and copper cores sandwiched between the layers of steel on the inside and outside, which is a much better conductor of heat than the stainless steel itself. Many manufacturers make their cookware with just a layer of stainless steel and aluminum on the bottom of the pots and pans, but the higher quality brands extend these layers up the sides to provide the most even heat for cooking. That being said, not all products feature stainless steel that can react magnetically (too much nickel content) and therefore these do not work well or at all with induction ranges. 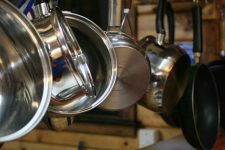 We’ve researched some of the top rated stainless cookware sets and individual pieces that do work well induction and have included some short reviews below. Mid-range items will have a two disks attached to the bottom, one of which is layer of a magnetic steel and the other being a thicker slicer of aluminum. This aluminum conducts heat fairly well (but not as well as copper). This is known as spun disk (as the pieces are formed on automated lathes) or as aluminum-encapsulated base construction. Since all of the aluminum is located on the bottom, the heat distribution from your cooktop doesn’t really travel up the sides of the pot leading to all of the thermal energy either entering through the bottom or dissipating into the air. Some brands of aluminum-encapsulated disk cookware add a layer of copper to the “sandwich” claiming that copper will assist with spreading the heat . Although it is true that copper is better conductor of thermal energy from the magnetically heated steel layer, the layer that is usually included in cheaper products is not really thick enough to matter. This doesn’t necessarily mean that the set is of bad quality, but it is a piece of marketing propaganda to keep in mind when shopping for budget induction ready cookware sets. 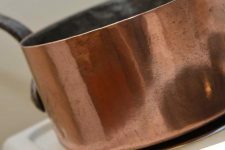 Also note that a copper is found on higher end (normally clad) induction ready cookware sets where it can make a difference in performance. Moreover, cooking vessels that are manufactured with spun disk bottoms will eventually face “separation issues.” In other words, after a period of time, the disk will start to detach itself. It may take 5 – 10 years before the vessel becomes unusable. 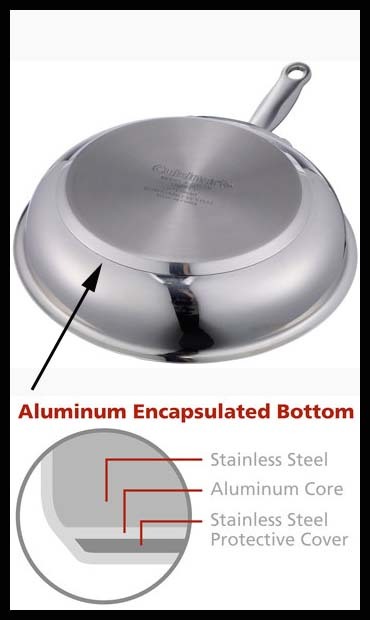 Aluminum-encapsulated base cookware products shouldn’t be considered a “lifetime” purchase. Then, there are the higher-end models with an aluminum core sandwiched between two think layers of stainless that form a homogenous structure along the bottom and up the sides. This is known as tri-ply or clad. This is really a sweet spot of performance, longevity, and price as long as you purchase a decent set or buy them individually. 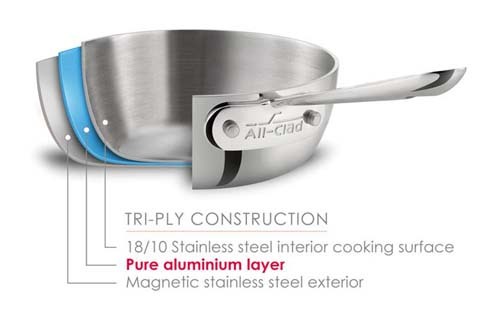 This cutaway of this tri-ply skillet shows the layers of aluminum and magnetic stainless steel. I’d suggest All-Clad’s basic tri-ply line if your wanting a product that is crafted in the USA, made of top grade materials, and that has a lifetime warranty that is actually “backed up” by the manufacturer. All-clad is known for even replacing abuse restaurant equipment via it’s warranty program. The next most expensive option consists of aluminum and copper core all throughout. This is basically a thin copper core that is bonded with a layer of aluminum on either side and then stainless is again bonded to the tops and bottoms of the aluminum. 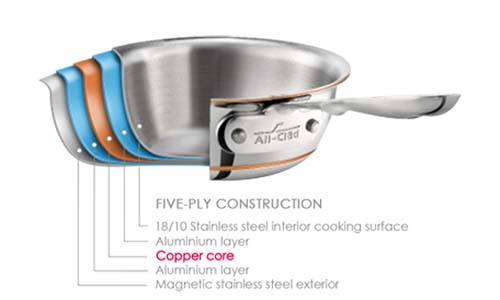 The copper core of this induction ready pan is showcased in this cutaway diagram. This is also known as clad and is often referred to as 5-ply. The inclusion of the copper ensure maximum heat distribution from the induction heated stainless steel on the bottom of the vessels – ensuring an even flow of thermal energy to all parts of the pan. My recommendation in the stainless steel category is to buy the best that you can afford – try to shoot for a really good set with American, German, French or other Western European manufacturing – usually the layer of copper is much thicker and the fit and finish are of a much higher caliber. I’d suggest considering Demeyere or All-Clad – they are expensive but you normally get what you pay for. It is worth noting that All-Clad has different lines offering various levels of quality and thicknesses at different price points. Be on the look out for several follow up posts exploring these options. If you don’t want to pay the admission price for All-Clad, Demeyere, or other highend cookware but really want performance of clad, then there is one option that we’d recommend. The Duxtop 10 Pc set is bascillay a Chinese made knock off of All-Clad’s tri-ply line. Surprisingly enough it is very good quality and has been getting rave reviews on Amazon. If you’re on a budget and aren’t concerned about the country of origin, then this is one great cookware set to pair up with your new induction stove. What about nonstick and induction? I want to have my cake and eat it too! If you already purchased an induction range, you’ve probably already noticed that many of your old nonstick pans don’t work anymore. This is because they are made completely out of aluminum and this material is not magnetically reactive. Some newer aluminum based sets do have built in iron plates that allow the pan to react really well to the induction cooktop. 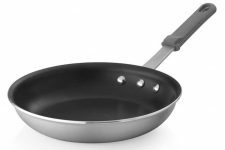 Don’t fet, there are some aluminum pots and pans that work on induction – you just have to search for them. If shopping online, you definitely want the description to say “induction ready” and if shopping at the brick and mortar department store, the box should say the same. 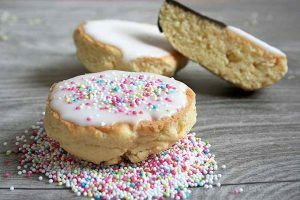 You may consider purchasing these one at time – many detectors that are built into induction cookstoves will not detect a magnetic base of under 4 or 5 inches – and many times the base is smaller than the diameter of the pan. Even if the nonstick cookware is induction ready, the smaller pans may not always work with your stove. If you want the best that won’t break the bank, I’d check out the Matfer Bourgeat Elite Pro Special Aluminum line (try saying all of that really fast). Made in France, Matfer Bourget is best known for its serious line of carbon steel frying pans, but they do offer very high quality cookware made in other materials as well. Matfer Bourgeat 668532 Elite Pro Special Aluminum Fry Pan with Induction Bottom available at Amazon. 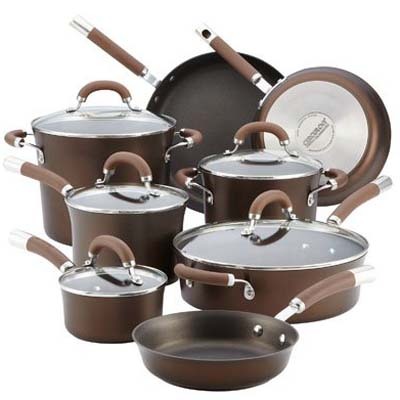 If you are looking for a set, then the Circulon Premier Professional 13-piece Hard-anodized Cookware Set may be of interest. The reviews that this set has on Amazon are overwhelmingly positive. 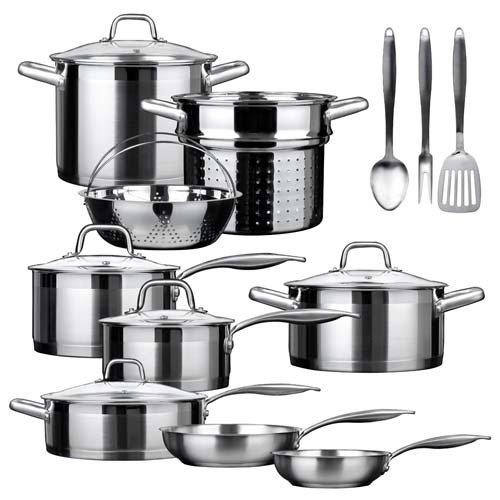 This set ships with 1, 3, and 4 quart saucepans – all with lids, and 8 quart stockpot with lid, a 4 quart sauté with lid, a 5 quart sauté pan with lid, and 8.4, 10, and 12 inch French skillets. Would you like cookware that is both naturally nonstick and can be cooked on at higher temperatures and is perfect for your induction range? Cast iron or carbon steel is your ticket. The good news is that both of these materials are MUCH more budget friendly. Cast iron has been with us for hundreds of years and the many pots and skillets that have survived over the course of the last century is a testament to its durability. My personal favorite maker is Lodge. 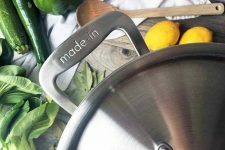 It’s still made in the US of a mixture of pure iron ore and recycled cast iron cookware. If you buy the made in China versions (i.e. 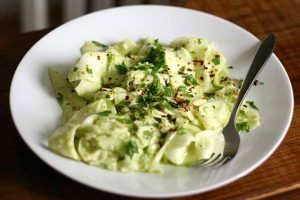 Emeril, Rachel Ray, and whatever flavor of the month is currently popular), you’ll be getting chunkier versions and who knows where they source their metal? I really don’t feel like cooking in what used to be an engine block for a 1973 Peterbuilt. Do you? 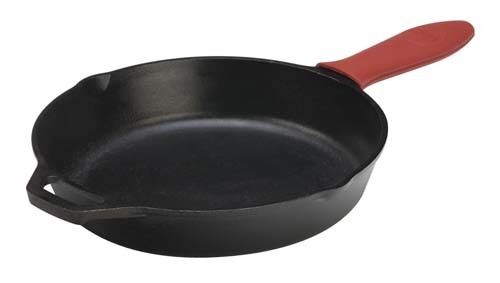 Most cast iron sold today is pre-seasoned (however, carbon steel is not) but if you purchase a pan that is not seasoned from the factory, it’s easy to do it yourself by rubbing a light layer of vegetable oil all over the interior and sitting it in a high-temperature oven for a bit. Seasoning is kind of a big deal with cast iron and carbon steel. It’s what keeps the food from sticking. For some people (including my husband), a big turn-off is when it comes to using these items for cooking is that you can’t use soap to clean the pans, since it removes the seasoning. You just use really hot water and a non-abrasive sponge. Carbon Steel – A lighter alternative to cast iron. If you don’t feel like lugging a huge cast iron frying pan up to the induction cooktop, a lighter, but still somewhat weighty (all good cookware is) alternative is carbon steel. 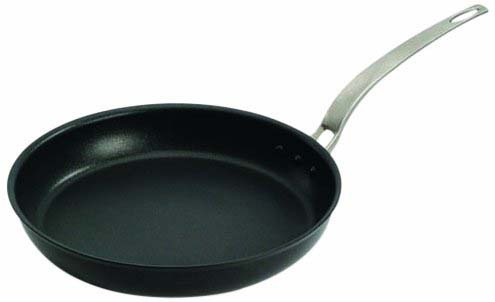 Primarily made into frying pans and skillets these offer many of the same searing and sautéing advantages of cast. However, you don’t have to be Arnold Schwarzenegger to move them around. 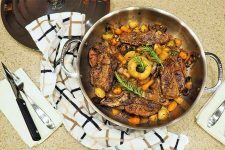 Check out my post where I dive deep into world of carbon steel cookware. 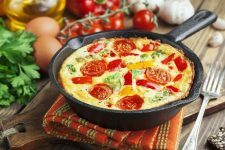 If you are wanting to prepare tomato-based cuisine or other acidic foods on your induction cooktop and you want cast iron, then the seasoned variety will not work well for this application. The acids eat off the seasoned oil leaving you with bare metal. The best tool to cook acidic food with on induction stoves is enameled cast iron cookware that is coated with a porcelain finish. Lodge does offer these, however there are no porcelain coating factories left in the US that can handle this type of lining. Therefore, Lodge imports their enameled line from China. 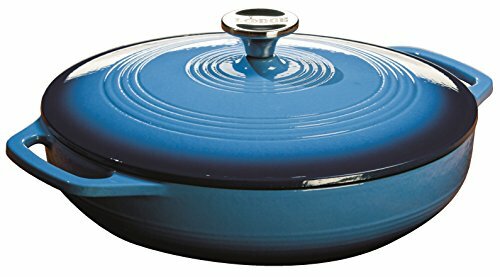 Although the imported Lodge “Color” line is pretty decent quality, I prefer to buy either the French made Le Creuset or Staub brands – they are great quality products that leave you with a satisfaction of using a premium tool. 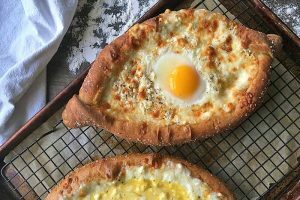 Dutch ovens – either in a round shape or in a oval – would serve you well in regards to serving up some prime chow without worrying about the acidity level. The basic differences between the two manufactures are exterior color options, of which there are many from both makers, and the interiors are a light beige in the Le Creuset and black in the Staub. The Staub is usually slightly cheaper for comparable products but not so much so that you’d choose one over the other based on price alone. 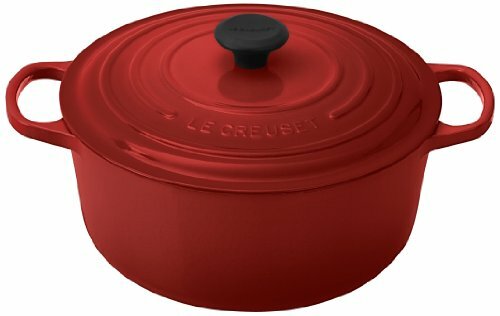 Le Creuset Signature 7-1/4-Quart Round French (Dutch) Oven in Cherry available at Amazon. 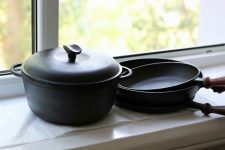 Check out this guide to learn more about what you should look for when choosing cast iron cookware. Copper – Is this time tested metal now outdated? Although normally not compatible with induction cooking, there is one more premium choice that you may want to consider – copper. 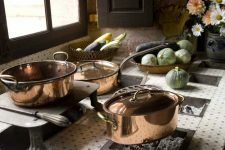 De Buyer has introduced the Prima Matera collection – a line of copper cookware that IS compatible with induction ranges. This line has a unique magnetic base that allows the magnetic waves to react with the pot and heat it up very quickly. The Prima Matera line is the top end when it comes to cooking with induction and they are the absolute best at spreading the heat to all ends of the pan – no matter the size of the induction heating pad. Click here to check out Lynne’s review of the Prima Matera. De Buyer’s Copper Prima Matera 6.3-Quart Saucepan available at Amazon. Need help in deciding between copper and cast iron? Check out Chelsea’s post to find out more. 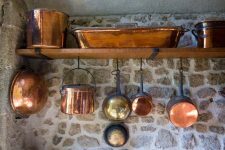 Graniteware – is it making a comeback? Graniteware is another option for induction compatible cookware. Made with a really light gauge of steel, graniteware has a speckled, porcelain coating on the outside and is typically (somewhat) nonstick. And Graniteware is the most budget-friendly option, for sure. Granite Ware 1- and 2-Quart Saucepan Set at Amazon. 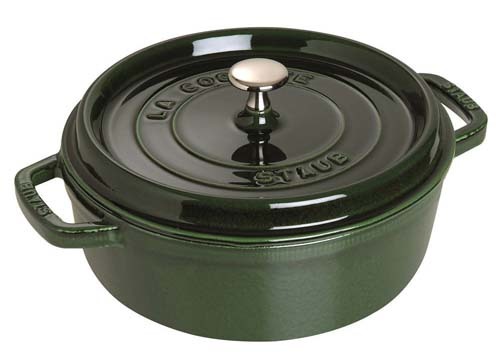 The one major drawback with graniteware is the nonstick enamled coating. As the thin metal flexes with use, the coating starts to flake off, and you have to buy a whole new set. Also, the thin material does not conduct heat very well. Hot spots galore! It’s still a good option if you’re not that huge into cooking or just blew your budget on your new stove, and you just need something that will work on your induction range or cooktop. Personally, I only use graniteware for home canning purposes or when I need a huge, but semi disposable stock pot or roaster. Bet you never knew you might have to go out and purchase all new cookware when you bought a new stove, did you? Although you may have to replace your old pots and pans when you install an induction stove (it’s a good excuse to get new goodies anyhow), you have many options in stainless steel, cast iron, carbon steel, nonstick aluminum and even an option or two in copper. Good luck and give us your thoughts below! Originally published on July 29th, 2014. Last updated: February 7, 2019 at 20:51 pm. I had no idea that not all cookware will work with an induction range. I was happy to see graniteware make the list. I don’t find graniteware at all in my area anymore. I still have a couple of pieces, but like you stated in the article, the enamel has flaked off. The Le Creuset Signature 7-1/4-Quart Round Dutch Oven in Cherry color is the exact pot that I have at home. I had Two, But, I gave one away as a gift. I have used the pot at a relatives homes on their induction stove. I found that the pot heated up very quickly. My last cooker was an induction range, I have moved house since and now am back on gas, which I prefer if I am honest. I used to use stainless steel, making sure the pan had a good flat connection to the oven. You raise some points I wasn’t even aware of though! Very interesting and comprehensive article. I always thought that the induction cooktop was just another name for a type of element material. It is very interesting how the heat is transferred onto the food and I’m sure it will taste better without relying on oil etc as much to get a good sear on foods. Wow- this article has come at a really great time for me. I’m getting a used induction stove from my mother in law this weekend!! I had no idea that there are preferred pots and pans for using on one. Thankfully I have much cast iron cookware at home, I’ll have to start really using them. I never knew there was so much science involved with induction cooktops either. I just have a pretty boring gas hob at home. I would second your recommendation of Le Creuset cookware. I have pieces that I purchased 10 years ago which still look and work as good as when I first bought them. They also keep their color well. These pans are rather expensive but well worth the investment. I have really been interested in getting an induction cooking range but my husband is stuck on his vision ware. But now that I know cast iron will work on it I might be able to sell him on it. Also we have some old cast iron from my Grandmother. Do you think it will work well with it or would I have to buy brand new? Tamaya, your Granmother’s cast iron is probably some of the best that you can find – especially if it pre WWII – a bit lighter and usually (but not always) finely ground. Add decades of loving use and you have a keeper. It’ll work with ANY heat source. We have an induction stove, and I believe what we have is just regular stainless steel cookware. It requires a bit of extra effort, as far as sticking goes, but the benefits of the induction stove definitely outweigh that. It’s so fast! And you don’t have to worry about burning yourself or accidentally leaving it on, because if it doesn’t sense any cookware on top of the range, it will automatically turn off! Well worth the expense. When frying with stainless, the trick is to let it heat up a bit, then add the oil. Don’t try to fry with cold oil. You’ll get minimal sticking. I never even thought of this issue. I’ve always used a gas or gas/electric hybrid with direct flames. Never solely electric. I’m a huge fan of cast iron but I can see how this would be an issue if direct flame were not a regular thing you’re working with. I’m actually preparing to move myself and was debating on whether of not we’d buy a gas range or an induction range. I really like the idea that all the heat is conserved and induced into the stainless steel pot rather then dispersing it in the air like a gas stove. I’ve cooked quite a few times myself on the gas range and each time I’m finished, I’m guaranteed to be sweating. This would be a nice option for me as I do not enjoy cooking in front of so much heat. 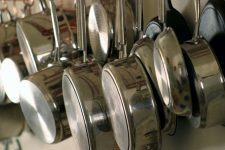 Not only has this article convinced me of switch my range, it’s also helped me decide on what which stainless cookware I would want to use with my new cooktop. Great article, helped me a lot! I think cast iron would do well with these stove tops. I have found that no matter what method of cooking you use with cast iron. Open fire, gas, electric you really can’t go wrong with it. I’ve been wanting an induction range for sometime now. Seeing that it may not work so well with my current cookware may cause me to think twice about getting one. What! You don’t wash your cast iron? Mine get washed almost every time I use them. Doesn’t hurt the seasoning at all. I love induction – I’m on my third but I’ve recently fallen foul of different materials. After installing our most recent induction hob we decided to replace our tatty old stainless pans and bought some “Suitable for Induction” aluminium pans. First outing for both hob and pan was the simple job of boiling up some water for pasta – it took an eternity! Decided to do a little experiment and selected one of my old pans of a similar size and measured out 1 pint (sorry, I’m in the UK) of cold water into each. On the most powerful zone with “boost”, so 3.7kW, the new pan took 2:45 to get to rapid boiling. After letting everything cool down I repeated with the old stainless pan and it took 1:20 to get to the same state. Half the time! You could tell by the sound everything was trying harder the second time round. I repeated again with the new pan just, because science, and got a similar result. So, not all induction ready cookware is created equal. There was no noticeable difference between them when applying a magnet which surprised me, so in summary it seems there is no substitute to trying them out on your own hob. I own a Thermador and use it every day. True that the induction stove does not produce heat but not true that the surface will remain cool. Any heated pan can heat the surface and can cause a burn. It’s important for consumers to know this before hand. I have seen many learn the hard way by putting their hand on the stove immediately after cooking. I am looking for the coil cookware not compatible ones. My friend wants the real deal. Where do I find these. I have looked everywhere online and have found none. Any suggestions? What is the brand of the pots in the very first picture of this article? Couldn’t find it listed. We included this photo to illustrate the induction cooktop – it is not one of the brands that we have reviewed. Great article. Any recommendations for an induction compatible double burner griddle, to take advantage of the flex zone, and cook a lot of pancakes and eggs at once. Lots of people online looking for this same thing but none of us have had any luck finding them that say induction ready. Please update this article, since it states that the top of an induction burner does not get hot and even suggests its somehow child safe. As a previous commentor noted, the surface the pot sit on is approximately as hot as the inside bottom of the pot simply because they are in constant contact. 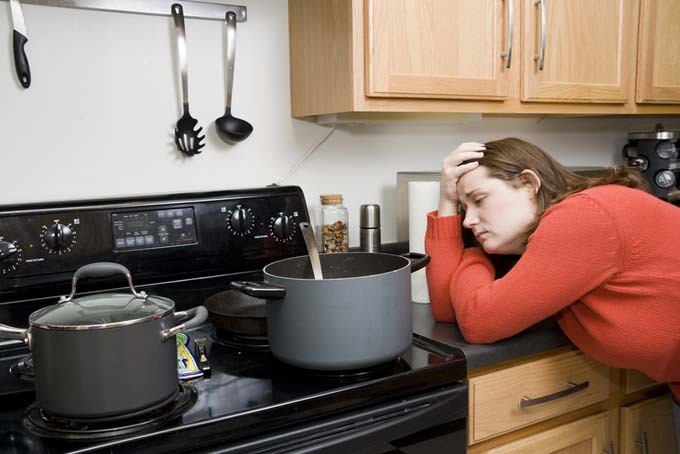 Any hot cooker, range, stove, cooktop or burner and anything on it now or recently including any pan or lid or contents can cause serious burns to everyone. Children and pets are usually unafraid of these things and the results are tragic. Thanks for your comment, Mark. It’s true- all children should be taught kitchen safety at a young age! However, the surface of one of these will not get hot if it is turned on without a pot on it, unlike your traditional gas or electric burners. Pots will certainly heat up significantly as the heat is transferred directly to the cooking vessel, and should be treated with caution. But the surface and framework are unlikely to reach temps as high as the pot itself, unless using a multi-burner model with all heating elements turned on at once. This isn’t foolproof, and some models actually include a light or flame indicator to show that the appliance is switched on, for extra peace of mind. We will clarify further in a future revision to this article- thank you again for your suggestion! I bought a Tramontina countertop induction unit (made in China) at Costco. It included a tri-ply universal pan (made in Brazil), which works well with it. Today I tried my Olvida nickel-clad cast iron skillet (Chinese cast iron, with nickel plating added in US) to cook some bacon and eggs. The pan heated quickly, but the heat was very centralized, and did not spread to the edges. So, we had bacon done in the center, while less-cooked on the ends, and the eggs, which went in after the bacon was done, only cooked when in the center. The Olvida works well on the gas, and, being nickel-clad, has all the advantages of cast iron without the seasoning issues. We have an old Italian-made Kirkland Signature stainless cookware set which is still in excellent condition. Unfortunately it was made in the pre-induction era, so it won’t work. Has anyone tried the latest K-S induction-ready stainless made in Thailand? It looks to be nearly the same quality as the Italian stuff. There is a lot of cookware for induction that is very heavy and that is without food or water in it. Please tell me the brand of quality induction cookware that is not as heavy. Ashley ~ Thank you for a superb and informative article!! I’ve decided on an induction range but had no idea about the cookware. You answered every question for me, except one (well, maybe two). The major question is: what about candy making, like peanut brittle. 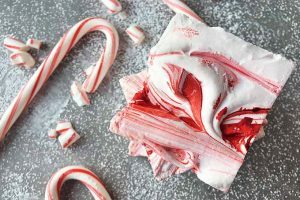 The time it takes to get to boil and desired temperature is what makes the carmel color and consistency, so if you can get a rolling boil at drag-racing speed, how does the candy turn out? And then, out of curiosity, the “waterless” cookware that my mom bought from a home party nearly 50 years ago – is that induction ready? Not sure of the exact article but I read somewhere that water-less cookware will not work on an induction cook top. I’m concerned about induction cooking “making a high pitched noise.” I’ve heard and read this now several times. Is this true and if so is it related to the quality of the cookware? Is there anything I can put on my induction stove to make my non-induction pots and pans work? 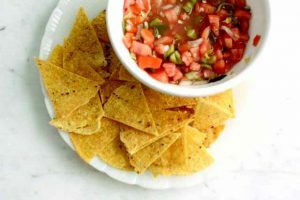 Yes, what’s known as an interface disc can be used with any type of cookware on top- but keep in mind that these vary in quality, and your non-induction cookware will take longer to heat up than it would on a regular stove. Heat times will also be longer in comparison to what you’d find if you were to use an induction-ready pot on this type of range. I’m a real old-timer, learned to cook with cast iron and of course you can wash it with soap, how else do you really get it clean? Do it all the time and it does not remove the seasoning. Have soaked pan overnight with no issues. Just purchased an induction cooktop and am looking forward to using my old cast iron. i have never heard the high pitched noise with my induction range, but i have heard it is more likely with cheaper pans, and i have quality all clad 5 ply. When we went to buy a portable double induction cooktop, we were told to make sure that whatever type of pan you buy has a flat bottom (as opposed to ones with rings, bumps, or other features that might scratch your cooktop). That really made it hard for me to find pots and pans that would work. I did however already own a stainless steel stockpot from when I was 18 that worked wonderfully both for my husband for brewing beer and me for canning. I believe I got that pot from Walmart for pretty cheap. 1. 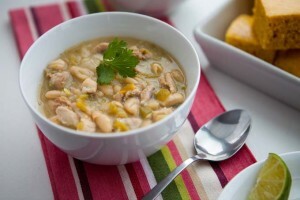 You don’t have to have flat bottomed pans. Being nearer to the coils under the appliance surface will allow you to get better induction in the pan but a few millimeters will not make much difference. 2. If you want to protect the glass ceramic surface of the appliance you can put a thin piece of silicon, Teflon or similar material under the pan(s). For low temperatures even a piece of cardboard will do. Avoid printed materials as the inks will likely melt and stick to your pan(s) or the appliance surfaces. Remember: Paper won’t spontaneously ignite until 451F so you should be okay up to 400F without problems. 3. 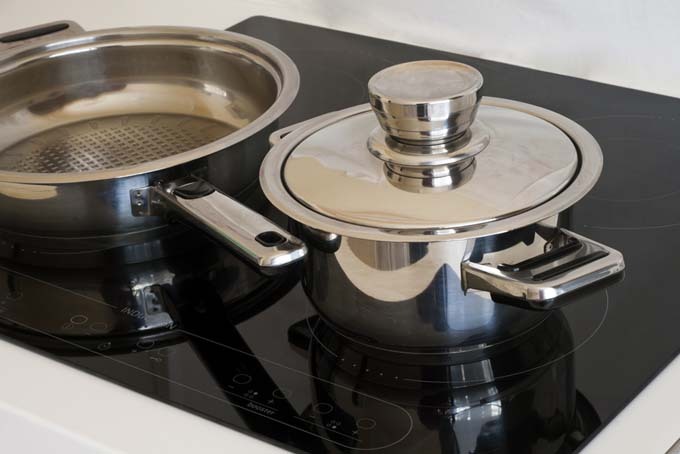 Some induction appliances, especially the table top variety, will only match the set temperature if the pan being used is optimal. That would be a pan similar the those used by the manufacturer to ‘calibrate’ their product. 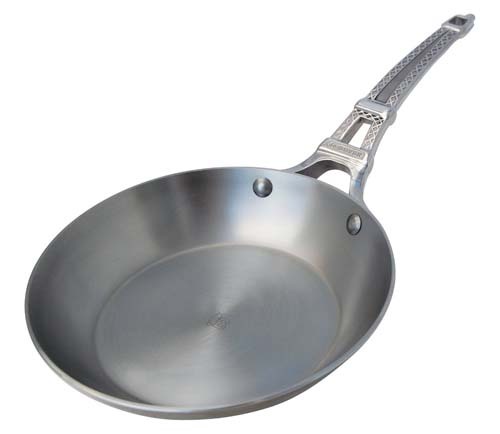 A thin steel wok, for example, will attain a different temperature ,over time, than a heavy iron saucepan. Generally, the heavier the pan, the stronger the magnetic field, the higher the ultimate temperature, once the pan has been heated long enough. You will need to learn the temperature difference for your pan(s) if the temperatures are critical to your cooking. I recommend using a small, inexpensive, hand held laser temperature gauge (< $20 anywhere), pointed at the cooking surface to learn how each pan heats in your situation. You can quickly cycle the gauge to watch the temperature as it rises until it becomes stable. Then compare the gauge to the appliance setting to know how to adjust the temperature setting for that pan in future. 4. While the induction coils will not heat the ceramic surface it will be heated by the pan radiating heat while it is in use. DO NOT put your hand on the induction cooker surface after cooking until you have let it cool down. The better (read more expensive) appliances will have a display showing when a heating surface is safe to touch. 5. Regardless of what a product's marketing literature may say, the induction coil for each heating surface has one size unless it is a more 'upscale' appliance with two coils (and usually two independent controls) under the marked heating area. If a brochure, or web page, says 3.5 – 8.5 inch pans may be used, beware. Just imagine an invisible column above the coil is where the pan will be heated. The field actually extends a little wider than the size of the coil but not by much. Also, the coil has a circular space at the center of the winding which can be quite large. The coil is actually shaped like an old fashioned ring doughnut. I recommend using pans that are close to the maximum diameter recommended for best efficiency. Smaller or larger will not work as well. For example, trying to melt a little butter using a small stainless measuring cup placed in the center of a large induction hotplate will likely not work very well, if at all, and nor will a 12 inch frying pan on an 8 inch ring. 6. Many 'portable' dual coil induction appliances may split the available amperage between the two plates if both are in use. For example, a dual plate rated at 1800 Watts may only provide 900 Max at each plate if both are in use and set to high. In that situation, don't expect either plate to work as well as they will when they are used individually. People using small induction appliances in RVs need to especially understand this. They need to clearly understand the available amperage and circuit breaker values if using more than one induction heating appliance, whether a dual unit a two, or more, individual units. For example, our motor coach we use two individual single 'ring' 1800W appliances with each plugged into separate circuits, i.e. on different circuit breakers, to avoid overloading them. 7. Do not use metal tools in your pans when cooking. A high temperature tolerant plastic is good and stiff silicon are better. Do not leave metal tools close to the heating surfaces. They can become very hot and burn you if you are not careful. 8. Most precious jewelry (gold, silver, platinum, etc.) will be unaffected by the magnetic fields in induction cookers. The exceptions can be steel or iron based earrings, neck chains, key chains, cheap broaches, metal buttons, etc. It is rare but it is not unheard of for someone standing close to an induction hob to find the metal buttons on their shirt getting warm. 9. Finally, resonant noise from the induction coils can be a sign that insufficient power is available. The power supply circuits inside the cooker may resonate trying to adjust the power frequency for efficiency and the coils themselves can resonate if the system is trying to draw more power than is available. Even the power coming from the utilities can be low at times and in campgrounds even more so. If you frequently use a portable induction cooker at the end of a long supply line, such a undersized extension cord out to the patio, you can anticipate a shortened life for your induction cooker. I love my induction cookers. Most of my cooking is done using Renaware brand stainless cookware we bought when we were first married over 50 years ago. It uses a layer of iron sandwiched between the stainless steel inner and outer surfaces to conduct heat up the side of the pans. I also use a 16 x 10 iron griddle placed across two 'linked' induction coils on the hob in our permanent home. That works really well when preparing lightly fried eggs or vegetables with a spot of olive oil. It will also sear a steak beautifully. Now I'm getting hungry. For us, one of the biggest benefits is that we are able to have a convection microwave oven directly above the induction hob with only 18 inches clearance. Since no heat is wasted flowing around the pans the bottom of the oven remains cool enough and the oven vent fan will draw and filter the vapors from the pans below. I have to stop now as I'm getting really hungry for some griddled mushrooms and brussels sprouts with potato cakes. A simple one griddle plate dish for two. Yum.